“The history of art is a sequence of successful transgressions.” With this statement, Susan Sontag summed up in 1966 the mood that would define the next half century of art. She speaks about modern art’s chronic habit of displeasing, provoking and frustrating the audience, in a gesture characterized by obliterating the selfsame audience or making it either voyeuristic or silent. “Traditional art invites a look. Art that is silent engenders a stare”. The ascent of photography and cinema to the category of art has significantly contributed to the culture of “staring”, and placed severe limitations on the contemplation that traditional art demanded. “Staring” however is more ambitious than it seems and less ostentatiously advances itself as more. The attention once required by art is replaced by a “total experience” as films and video-installations seem to confirm. Graffiti – together with performance – is one of those artistic practices that belong in both transformations of the place of art, in terms of geography and authority. The practice born in Philadelphia in the 1960’s with the now canonical names of Cornbread and Cool Earl, spread quickly to the Washington Heights section of Manhattan. Already in 1971 graffiti writer TAKI 183 had made it to a New York Times article. What follows from there is a long list of trends, writers, styles and a never-ending conquest of the public space by graffiti, first in the US, followed by the Netherlands and then the world over. Already in the 1980’s there was something of a decline in the graffiti culture in the West as it became fraught with violence together with the hip-hop and punk scenes and faced with legislation, but far from a terminal end, it would only begin a new larger chapter. Since then graffiti has been an established as a “genre” of political, social and cultural communication. We’re not dealing here only with political activism and social messages, but also with street advertisements, music culture and lastly, stencils and Krylon have also become part of the repertory of techniques to be mastered in art schools the world over, but the place of graffiti in the canon of art remains very difficult to pin down. The use of graffiti in art isn’t limited only to celebrity graffiti artists such as Bansky, but can be seen also in mainstream practicing artist, of which Andy Warhol of only one of many examples. In the age of mechanical reproduction of artworks, it would seem as if the criteria to judge artworks such as graffiti shouldn’t differ much from the one applied on drawing and painting, but the place graffiti occupies in the public space blurs the distinctions. Beirut is known for being a graffiti artist’s dream city and interesting graffiti work is found most prominently in the central neighborhoods of Hamra and Gemmayzeh, as well as in the northeastern industrial quarter of Karantina. But the history of graffiti in Beirut – though it cannot be dated with exactitude – is a lot more complex: Political graffiti served the purpose of dividing the city into quarters during the Civil War. Whoever has watched Ziad Doueiri’s celebrated “West Beirut” (1998) would not fail to recognize the writing on the wall throughout the city – political statements, religious icons, martyrs. After the end of the war, the checkpoints and roadblocks disappeared – although they make spectacular comebacks from time to time – but the sectarian geography of the city remains more of less intact with invisible checkpoints: posters, graffiti or specific buildings. Graffiti in Beirut, though common, is still illegal – as in most parts of the world – but the authorities, operating on a policy of laissez-faire, tend to turn a blind-eye and with a city in constant destruction, construction and reconstruction there’s plenty of temporary and permanent space for this kind of work. It wasn’t the end of the Civil War itself however, what really propelled the birth of a graffiti art scene. First there was the return of the music scene to Lebanon in which hip-hop and indie/post-rock styles coming mainly from France but also from elsewhere, that arrived in Lebanon with its own urban culture, and then in 2006 during the Israel-Hezbollah War, with the life in the country paralyzed, people took to the streets in order to reclaim the public space as their own, having nothing else to do, and with messages such as “Beirut will never die”. Though there is plenty of graffiti to be seen in Beirut, there are only a handful of graffiti artists who can work on large scale stencils but the scene is constantly growing. International interest in Lebanese graffiti is also partly the consequence of Pascal Zoghbi’s book “Arabic Graffiti” that next to Montreal, Berlin, Gaza, Paris and other cities, references extensively street art in Beirut. The role of graffiti art in Beirut is now the reverse side of the political separation: Messages of unity and criticism of the government are common, and in the words of Phat2, one of the most prominent players in this scene: “As a free Lebanese citizen, I refuse to accept the fact that Lebanese areas are partitioned according to their residing majorities.” There are plenty of examples of how the Lebanese have reclaimed the public space. While not all the graffiti scene is committed to the public space – and there are a handful of commercial graffiti writers, working in advertising and decorating private spaces such as gardens and children’s bedrooms – it cannot be said that the laissez-faire policy of the authorities operates at all times, as there are several taboos on what can be discussed or represented in public and censorship remains clumsy but firm. 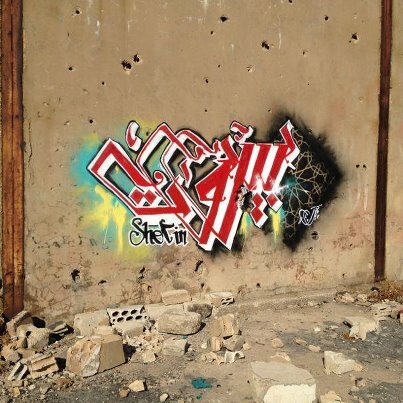 In April, graffiti artist Semaan Khawam was charged with “disturbing the peace” because of having spray-painted graffiti of soldiers such as those that took part in the civil war. His series “Do not forget” included soldiers armed with machine guns but without sectarian identification, in order to convey the message of shared responsibility in the war, what remains for the most part unacknowledged by political leaders that rose out of the selfsame sectarian landscape of the civil war. Further divisions emerged in Beirut through graffiti over support for the Syrian revolution, which is a particularly sensitive issue in Lebanon, with activists and graffiti artists being arrested and questioned. Freedom of expression in Lebanon, though praised much in the Arab world, is something of a myth and the Lebanese are constantly fighting bitter battles against the establishment to have their rights and freedoms respected. But the graffiti culture keeps thriving in Lebanon. In 2011 Phat2 released the film “Bombing Beirut: The Movie” (making reference to the “bombing” developed by graffiti artists in the 1960’s and 1970’s trying to cover as many spots in as little time as possible, rather than once again bombing Beirut) chronicling the birth and rise of the Lebanese graffiti scene and showing the underground bombings, featuring a large number of graffiti writers. In June, Lebanese animator and filmmaker Alain Nasnas, whose first short film “Et Si” was featured on BikyaMasr.com in March, released a very short documentary about graffiti artist Yazan, one of the youngest writers in Beirut, and who has developed a particular style called “calligraffiti” based on traditional Arabic calligraphy combined with urban styles; Yazan is also known for working on very large stencils. Yazan’s style is particularly unique in Lebanese graffiti and somehow resembles the interesting work done by Greek artists Greg Papagrigoriou and Simek in Athens, working with traditional calligraphies but less colorful and certainly a lot more formal than Yazan’s. The walls of Beirut keep speaking and telling the untold stories that do not find their way into the textbooks, the mediocre censored media and the political demagogy of reconciliation and reconstruction. The question of whether graffiti is street art or vandalism isn’t one of easy resolution: In 2008 in London, at the same time that graffiti artist Bansky had some of his work exhibited at the Louvre and Tate Britain, a group of south London graffiti artists were sentenced to jail time for defacing public property at the same that their work was being championed by a New York gallery.